What a shame… I only ever saw it as a force for good, a conduit to finding out “what is really going on”. I for one will miss it. Thank you for making me feel passionate (but frustrated)! about Abingdon. 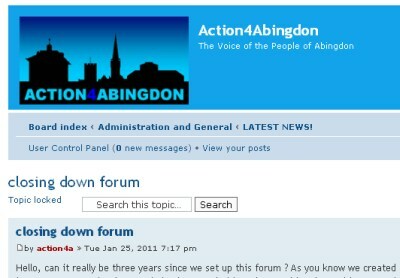 I hope the people responsible for the forum are successful in their future Abingdon endevours with their honesty and truth telling of the decisions and decision makers who mould our town to what it is today. Long may you continue to ask the questions that need asking, for all of us.